It's funny how when the weather is nice outside I am less inclined to be indoors crafting and more inclined to be outside looking for slugs and ladybugs with P & J. After our bug expedition we still needed to eat and I had blueberries in my refrigerator. 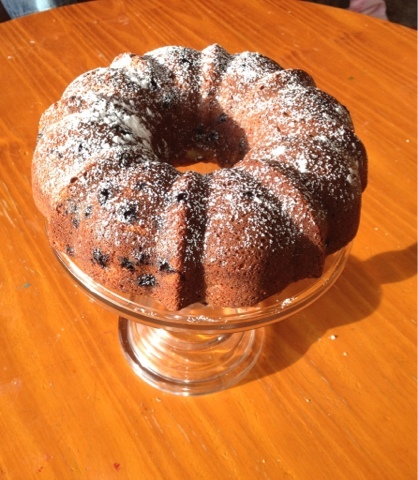 I opted for a Blueberry Bundt cake from Martha Stewart's Everyday Food Magazine. Wow! This cake was not only easy to make it tastes incredible! It is one of those foods that doesn't need anything else to make it "that much better" because it is "that much better" all by itself!